It's really very easy to use. It only needs 3 easy steps. Dock iPhone and open it, connect iPhone to your computer through USB cable. 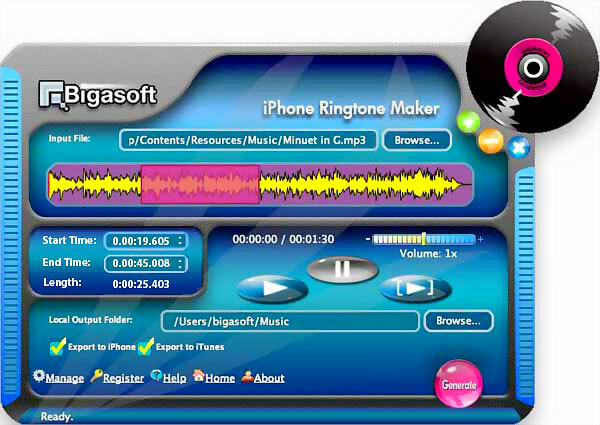 Open Bigasoft iPhone Ringtone Maker. Add your favorite music file into it (shown as picture). It supports a variety of formats, such as MP3, WMA, M4A, WAV, MP3, RA, AVI, MPEG, WMV, DivX, Xvid, MP4, H.264/AVC, AVCHD, MKV and so on. Now, press the Generate button, Bigasoft iPhone Ringtone Maker will convert your chosen to iPhone ringtone M4R and sync to iPhone via USB cable automatically. 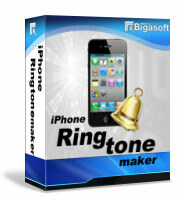 Free download Bigasoft iPhone Ringtone Maker and make custom iPhone ringtone to express your personality right now! To support direct transfer ringtone to iPhone, iTunes 7.4 or later are required.